I’m sitting on my couch watching Game 5 of the World Series right now and I’m exhausted. It’s been such a busy day, but I feel like I haven’t accomplished nearly enough. I currently have a few more dishes that need to be washed before I go to bed, but I’m just about done with everything that I can fit into this weekend. And I actually crossed a lot of things off my to do list, but there is an alarmingly large number of untouched items too. 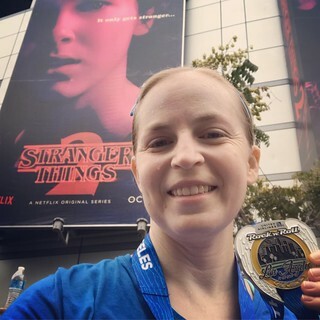 Today started early because the Rock ‘n’ Roll Los Angeles half marathon kicked off at 6:45 AM in Downtown LA and I had to meet my running buddies at an ungodly hour in order to get there in time. Luckily the race itself was great, even if I ran it at a fairly slow pace. In spite of the many hills on the course I felt strong for the entire 13.1 miles, which was wonderful. And the weather was so perfect. Cloudy, cool, and even dense fog all over Los Angeles. After the completely out of character heat wave last week I will cautiously declare that fall has finally arrived in Southern California. Just in time for me to leave town on Wednesday, of course. My other major achievement of the day was making my traditional batch of chili for Halloween. Traditional in the sense that I have chili every October 31st, not that I make the same recipe every year! I had some time on my hands this afternoon because I decided not to go to work today after hurting my foot during the half marathon. Fortunately it seems to be much better this evening. This year’s chili cook-off entry has three different kinds of pork – bacon, ground pork, and carnitas. A friend of mine suggested the name Three Little Piggies chili and it’s perfect! I honestly haven’t eaten any of it yet, but if it tastes as good as it smelled while it was simmering then I think my co-workers and I are in for a treat. I’ll let you know how the chili cook-off goes this week. Speaking of food, on our way back from the half marathon this morning my running buddies and I stopped at Starbucks for a late breakfast (around 11 AM). Since there are only two days left of my self-imposed diet, I intended to stick to it as much as possible today (with the exception of Sports Beans and Pedialyte while running), but I was really hungry after the race. I scarfed down a Starbucks breakfast sandwich (sausage, egg, and cheese) in record time and then washed it down with a small hot chocolate. Not at all diet-friendly, but my body desperately needed fuel and it all tasted amazing. When I got home I started keeping track of my meals for the day, but it ended up being an underwhelming list and I deemed it not worth sharing. As hungry as I was after running 13.1 miles, I strangely didn’t eat a lot after that Starbucks meal. I’m trying to clean out my fridge before going on vacation so for dinner I had a salad with some leftover chicken and whatever veggies I found in my crisper drawer. Delicious, if not exciting. Tomorrow is my last day of this Whole30-ish experiment so we’ll see how well I can stay within the diet parameters with the end in sight. I’m hoping to finish strong! ← Day 28 – Halloween is coming! "Everybody sees what you appear to be, but few feel what you are."